George IV delighted in redesigning and developing his royal residences. 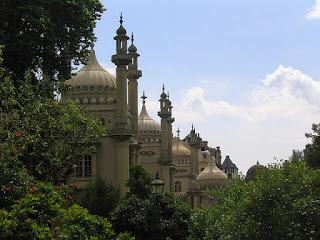 Nowhere is this more apparent than in the Royal Pavilion, Brighton. 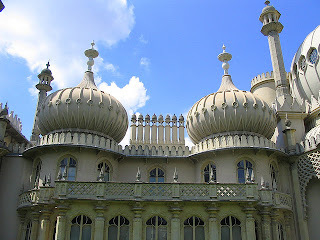 During the first phase of royal occupancy, the original farmhouse was converted into the Marine Pavilion by Henry Holland, but George soon tired of its Neo-classical perfections and commissioned the orientalising of the interiors. In 1803, George engaged William Porden to build a new stable block. His Indian-influenced design incorporated a huge glazed iron roof based on the domed trading floor of Bélanger’s Halle au Blé and cost £49,871 to build. A contemporary guidebook described it as a “truly magnificent building”. However, the new stables and riding school dwarfed the main building, and George was soon seeking new designs for the pavilion itself which would be compatible with their magnificence. 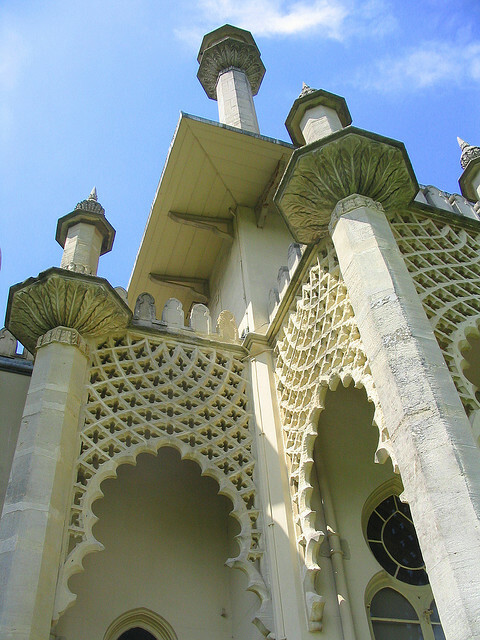 Although temporarily halted by lack of funds, in 1815 George was finally able to commission John Nash, his new favourite, to redevelop the pavilion using the picturesque qualities of Indian architecture. Nash added two square blocks, one at each end of Holland’s Marine Pavilion, crowning each of them with a tent-like roof. In the centre, above Holland’s rotunda, Nash placed a huge onion-shaped dome, and he echoed this feature by adorning the roofs of the adjacent wings with smaller versions of this dome. The concave nature of the tent-like roofs balanced the convex shape of the onion-shaped domes, and, together with the tall Islamic minarets and chimney stacks, cleverly gave height to the long, low profile of the pavilion. Nash is recorded as borrowing Thomas and William Daniell’s “Oriental Scenery” from the prince’s library and he used inspiration from these pictures of genuine Indian buildings for some of the details of his designs. One such element was the perforated stone screen based on the Indian “jali”, designed to provide shade and ventilation in the heat of the Indian summer. This was made from Bath stone and was situated between the tall Indian pillars which masked the saloon, music room and banqueting room. The rest of the walls were covered in stucco. But although Nash’s design was primarily Hindustan in style, he delighted in pulling together ideas from other places in a truly eclectic manner. The extended pavilion was classically balanced and the way he grouped the tall chimney stacks together was distinctly Tudor in style. Even the “jali” was not truly Indian; the design used in the pierced stone was of a Gothic quatrefoil. Nash’s pavilion boasted two exceptional new rooms. The first of these was the music room, which was situated in the new square block to the north with an additional extension for the largest English-made organ of the time. The room was decorated in a the Chinese style with a dramatic colour scheme of “Carmine, Lake, Crome Yellow and other expensive colours”, and a huge marble and ormolu chimney piece, made by Westmacott and Vulliamy which alone cost £1,684. Winged dragons sat above the curtain pelmets and huge crimson and gold murals adorned the walls, framed by dragons and serpents. Water-lily chandeliers were suspended from the high vaulted ceiling so that they seemed to float in the air; they were converted to gas in 1821. The whole was topped by a tent-like octagonal cornice and the furnishings included six large Oriental porcelain pagodas made at the Spode factory. The banqueting room, to the south, was equally magnificent, with its decorative scheme by Robert Jones. The forty-five foot high dome was painted as if it was open to a tropical sky and was almost completely filled by the representation of a huge plantain tree. From its centre, an enormous dragon was suspended, which held a thirty foot high chandelier in its claws. The chandelier alone cost over £5,600. Four lotus-leaf bowls also hung from the ceiling, suspended by “Fum” or “F’eng” – Chinese mythological birds. The furniture included two “very large and superbly decorated Sideboards”. 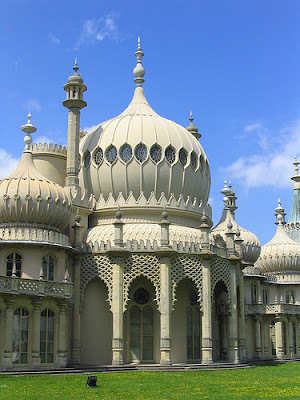 George, Prince of Wales, first rented Brighton House from his German chef and general factotum, Louis Weltje, in 1786. This “superior farmhouse” was situated on the Steyne, a fashionable promenade, with views of the sea to the south. It was not until 1793 that Weltje formally leased the pavilion to the prince at a cost of £1,000 a year. Henry Holland was the architect that George chose to redesign the pavilion. Holland had already completed the transformation of Carlton House into a Neo-classical masterpiece and it was the same Neo-classical inspiration that influenced his designs for the pavilion. He built a rotunda over the grand saloon to the north of the existing building and then added an extra wing beyond that to balance the original farmhouse, thereby creating a symmetrical building. The old wing contained the prince’s private apartments whilst the new wing provided space for an eating room and a library. The rooms to the north and the south of the rotunda were bounded by a corridor to the west which enabled easier access. Holland’s design incorporated bow windows and iron balconies which have become indicative of regency style, with French windows along the whole of the Steyne front. He used cream-glazed Hampshire tiles to cover the walls of both old and new buildings to create a uniform whole. During 1787-8, £21,454 was spent on redecorating the villa and fitting it out with expensive French furniture. The rotunda was the centre of the Marine Pavilion, housing a circular drawing room which was the only large reception room in the house. Outside the tall French windows of the saloon, Holland built a row of pillars, giving the rotunda a classical appearance. It was originally decorated with Neo-classical paintings by Biagio Rebecca. Records show that he was paid the sum of £160 for painting the spectacular sky ceiling. In 1802-4, the saloon was redecorated in the style of a Chinese garden arbour. A bamboo balustrade was added above the cornice, with the open sky painted on the ceiling above. The walls displayed large panels of Chinese painted wallpaper with a bright colour scheme of blue, red and yellow. Even as early as 1800, George was becoming bored of the neo-classical beauty of Holland’s pavilion and was looking for new designs. His taste now showed a marked preference for the Chinese style. 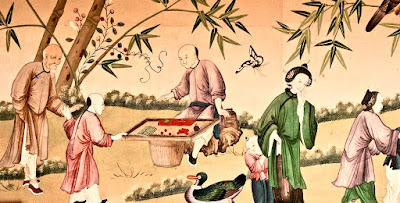 It has been suggested that this was provoked by a gift of “very beautiful Chinese paper” in 1802, but drawings from the previous year indicate that the prince was already looking at designs in the Chinoiserie style. It is possible that he was influenced to some extent by Chamber’s Chinese Pagoda at Kew. By 1803, £12,799 had been spent on orientalising the interiors of the Marine Pavilion, primarily at the hands of the firm of Crace. A contemporary guidebook of 1815 declares that the furniture is “Chinese and is uncommonly splendid”. 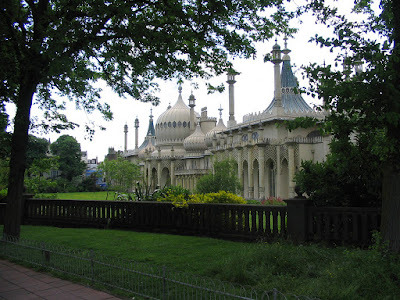 But the prince was not content with the Marine Pavilion for long. Whilst the interiors were being transformed into the oriental style, Holland, and his nephew and pupil, PF Robinson, were extending the main building to include a new eating room and conservatory, and a new entrance hall was created by extending the portico out to the west. The ground floor rooms of the original villa were also amalgamated to form two larger galleries on either side of the central saloon. 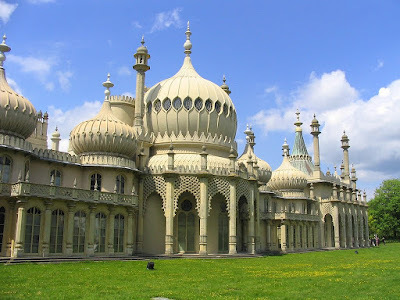 In 1815, the prince commissioned John Nash to redesign the pavilion; the result is the Brighton Pavilion as it is today which leaves little of Holland’s Marine Pavilion apart from the grand saloon housed by the rotunda. George IV was passionate about architecture and delighted in the opportunity of putting his ideas into practice. With little thought of cost, except when his finances dried up, George indulged in extravagant building projects where his taste was allowed free rein. His architectural schemes included the redevelopment of Carlton House, Brighton Pavilion, Buckingham Palace and Windsor Castle. There is no doubt that George had a keenly developed aesthetic sense. He was an enthusiastic patron of the arts and became involved in his building projects on an intimate level. He did not merely commission the redevelopment of his royal residences; he scrutinised the plans in detail and continually made changes to the designs. Working closely with architects like Henry Holland and John Nash, who would carry out his wishes without demur, he was able to exert a substantial influence on the execution of the plans. Perhaps his greatest achievement was the original redevelopment of Carlton House by Henry Holland which was greatly admired. The French-inspired, Neo-classical villa was deemed by Horace Walpole to be “the most perfect in Europe” and has become indicative of the Regency style of architecture. The interior was fitted out in sumptuous style but with a restrained elegance that was the epitome of classical taste. But with a restlessness that is mirrored elsewhere in his personal life, George was never content with the results of his endeavours for long. He was continually redecorating and redeveloping, as clearly illustrated by his relationship with Carlton House. The Rose Satin Drawing Room at Carlton House had four different chimney pieces between 1784 and 1819, and the colour of its silk wall-hangings and seat upholstery was changed three times during a ten year period. More fundamentally, Holland’s beautiful classical interiors were later completely obliterated by the designs of the amateur, Walsh Porter, who introduced the Admiral’s Room and the Military Tent Room. The whole was then redeveloped again when George began his regency, this time under the auspices of John Nash. But the ultimate display of George’s fickleness came in 1826, when, despite the huge costs of its final redevelopment, he ordered that Carlton House be completely demolished. Brighton Pavilion also suffered from George’s ever-changing inclinations. 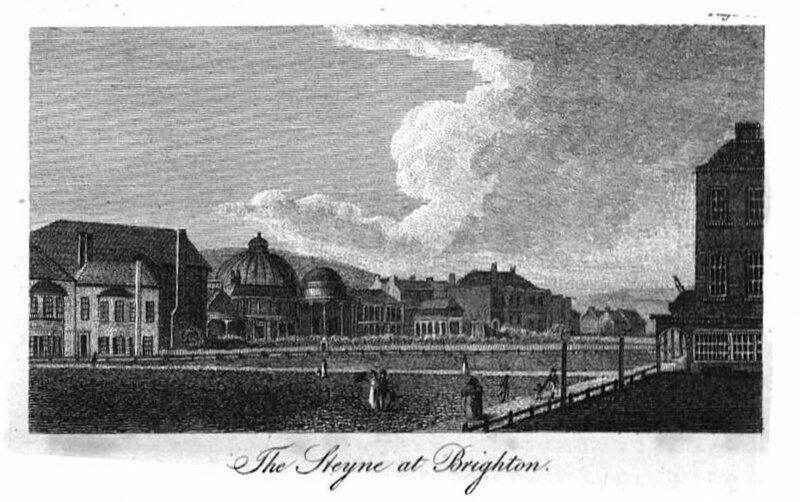 In the early years of his residency, Brighton House was developed by Henry Holland into the Marine Pavilion – a Neo-classical villa which displayed a similar elegance to the Carlton House of the same period. Tired of the Neo-classical influence, George then commissioned the redecoration of the interiors in the Chinese style by the firm of Crace, and subsequently the addition of a huge domed building, housing a stable block, in the Indian style, designed by William Porden. The whole of the main building was then redesigned by John Nash, who added the magnificent Music Room and Banqueting Room and a bizarre array of domes and minarets to the roof that gave the Pavilion a distinctly eastern appearance. 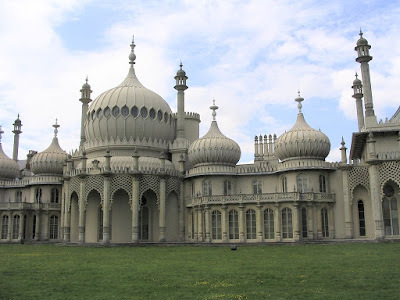 But true to character, but a few years after his final designs were completed, he abandoned the Brighton Pavilion altogether. It stands, however, as an enduring monument to the frivolity, extravagance and ever-changing taste of George IV. Huge amounts of public money were spent on George’s architectural projects. Costs continually spiralled out of control as his architects failed to keep a check on the ever-increasing costs of incorporating George’s latest whims. For example, in 1785, the costs at Carlton House amounted to £147,293 but Holland estimated that he needed a further £69,700 in order to complete it. George IV first visited Brighton in 1783 as the young and charming Prince of Wales. Attracted by the freedom that the town gave him, away from the repressive austerity of the court of his father, George III, the prince made Brighton his second home for nearly forty years. 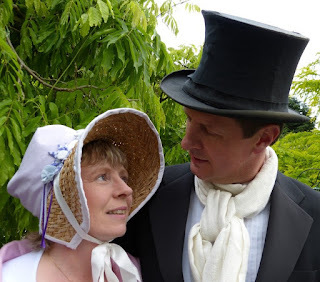 Despite growing unpopularity during his Regency and subsequent reign, the town remained loyal to the monarch who had helped bring it into fashion. George first began visiting Brighton in the company of his disreputable uncle, the Duke of Cumberland. 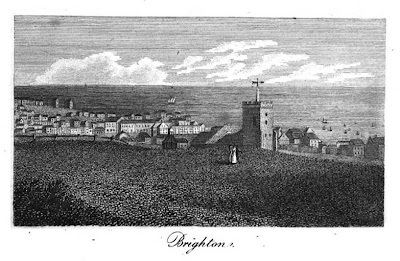 By the 1780s, the simple fishing village of Brighthelmstone was growing into a fashionable seaside resort. Brighton could offer the elegant entertainments of ballrooms, card rooms and libraries alongside the natural benefits of Dr Russell’s famous cure – both bathing in, and even drinking, sea-water. George himself came in 1784 to take this sea-water treatment for a bout of ill health. George determined to form a permanent establishment in Brighton. From 1786, he rented Brighton House from his chef, Louis Weltje, which was then developed by Henry Holland into the Marine Pavilion. Finally taken on a lease of the property in 1793, George continued to develop it, transforming the interiors with oriental designs in the 1800s through the skills of the firm of Crace. A magnificent new stable block was added in 1803, designed by William Porden, and in 1815, the prince employed John Nash to extend the main pavilion using Indian influences. 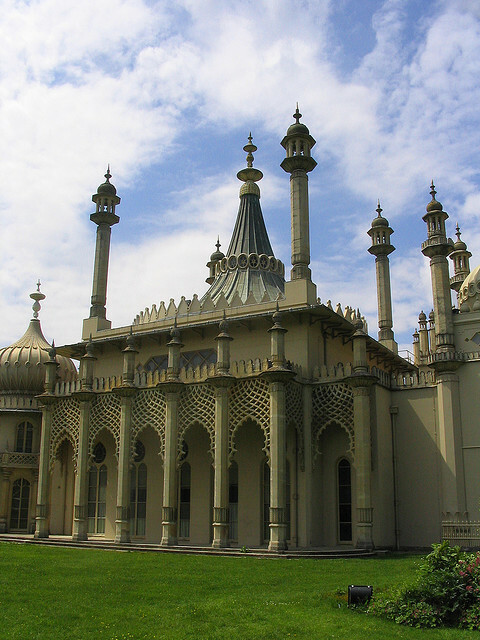 Nash added the banqueting and music rooms, and transformed the silhouette of the pavilion with a cacophony of minarets and bulbous, onion-shaped domes. 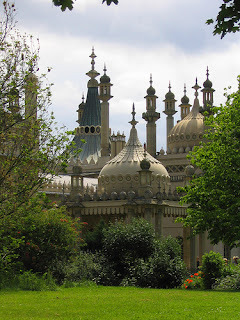 Brighton provided a safe haven for the prince and his secret wife, Mrs Fitzherbert, away from the critical eyes of the London ton and, more importantly, the disapproval of George III, who was vehemently opposed to the relationship. 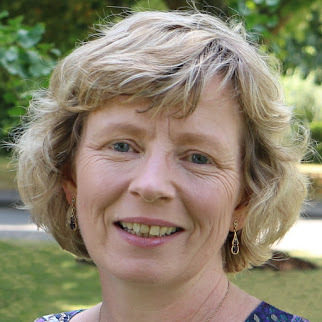 Mrs Fitzherbert did not live at the pavilion, but had her own house on the Steyne. According to a contemporary guidebook, this “elegant modern mansion has a handsome brick-front toward the Steyne, with a colonnade, a double staircase, and a beautiful painted window, leading to an elegant suite of rooms, fitted up with much taste.” The modest residence boasted a long veranda which overlooked the Steyne. During the last years of his life, George IV was grossly overweight and suffered from perpetual ill health. He grew reluctant to be seen in public and by 1827, he was virtually a recluse. 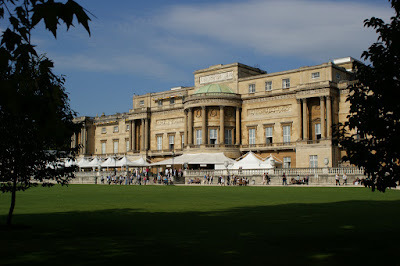 Brighton had become much too public for his taste and he required the privacy that the Royal Lodge, in the middle of Windsor Great Park, could offer him. 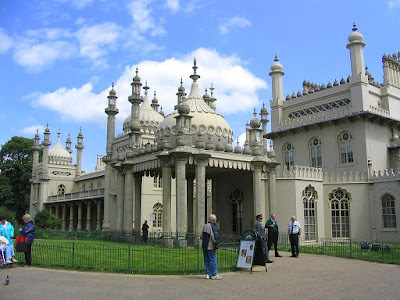 His last visit to Brighton was in 1827; he left on 7 March 1827 never to return.